​Students planning to attend are encouraged to dress professionally and bring plenty of resumes. This event allows students to meet and get to know professionals at various levels of employment, and affords them a chance to talk to these individuals one on one. 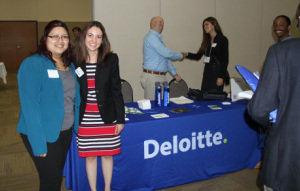 ​Meet the Firms night is a great way for students of Accounting, Finance, MIS and other areas to interact with professionals representing some of the largest employers in the area. Meet the Firms is an annual event, held at the beginning of each Fall semester.